Getting started with Cardhop is extremely easy because it taps into your existing contacts database as configured in the Settings app. All the contacts you see in Apple's Contacts will, upon granting permission, be automatically displayed in Cardhop as well. At the center of Cardhop's appeal is a feature that's entirely unsurprising to find in a Flexibits app: a strong natural language input system. Flexibits' popular calendar app, Fantastical, has included natural language input as one of its core strengths for years now, and Cardhop proves that it's just as powerful when applied to contacts. Near the bottom of Cardhop's interface on nearly every screen of the app, you'll find a search box. Typing in this search field using natural language enables quick entry of new contacts, adding new data points to existing contacts, or triggering an action that reaches out to one of your contacts. Put simply, Cardhop's natural language system works extremely well. When you're adding a new contact, you can simply type out the person's name, email, phone number, and more in a continuous string, then hit 'Add Contact' when you're done. You don't need to specify what type of data you're entering (e.g. phone, address, email, etc.) because Cardhop does the work of recognizing that for you – as you type you'll see your input transferred automatically into the appropriate fields of a new contact that's being created by the app with each keystroke. It's very fun to watch. Just as Fantastical's event creation system easily bests that of Apple's Calendar, so is Cardhop's method of contact input clearly superior to Apple's Contacts. As I mentioned, Cardhop's natural language system is not only for creating new contacts, but also adding to existing ones, and triggering actions. The former requires typing the targeted contact's name in the search field, but even here Flexibits has simplified the process by recognizing abbreviations rather than requiring full spellings, and offering multiple immediate suggestions as needed based on what you type. When you find the right contact, hitting 'Update Contact' will add the search field's data to their contact. Actions are an interesting method of engaging with your contacts. 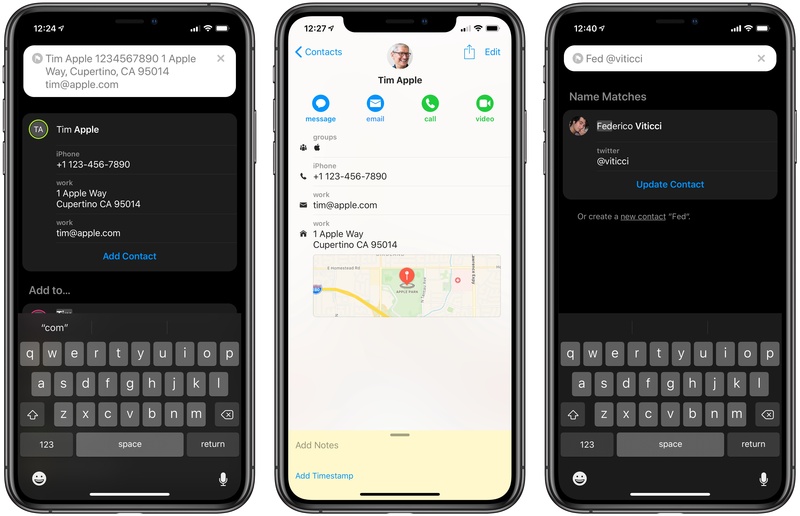 Similar to how Apple's Contacts enables you to kick off a message to someone, or look up directions to their place, or initiate a call – all by hitting buttons saved in someone's contact – you can do the same in Cardhop, but without having to locate a person's contact card first. Instead, you can simply type in the search field what you want to do – whether call, email, FaceTime, tweet at, or any other supported option – along with the person's name, and trigger an action right from the search field. 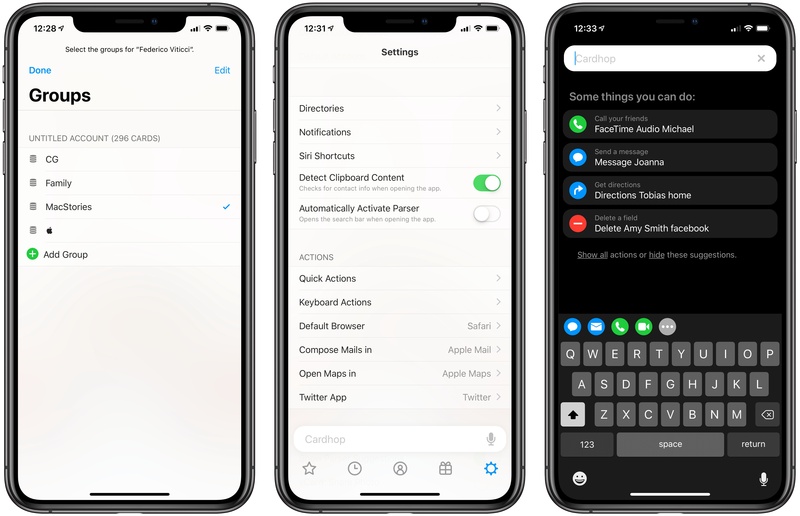 Actions are also available in two other places: in a special keyboard row that's present whenever you type, and in your main contact database you can access them with a swipe right on a contact's name. Besides all the obvious supported actions, there's one action type I wanted to mention that's nice to have: copy. By typing 'Copy' then someone's name (or, more likely, just the start of their name), Cardhop will present a card featuring that contact's different contact details, all of which have a convenient button next to them that copies that specific data to your clipboard. It's a small thing, but it can be really useful on a regular basis. Although I expect most users are in the habit of initiating communication not from their contacts app, but from the appropriate communication apps like Messages, FaceTime, or Mail, actions are still a nice option to have, and with a bit of forceful habit change they could make Cardhop a powerful one-stop-shop for your communication needs. Just as Drafts is "where text starts," Cardhop could be "where communication starts." Cardhop's natural language input system, and the power it provides, is the clear highlight of the app. However, there are a lot of other niceties that make Cardhop a compelling alternative to Apple's Contacts. Birthday tab. One of Cardhop's five main navigation tabs is a Birthdays screen, which lists upcoming birthdays from your contacts in a simple, well organized layout. Although many people have outsourced birthday management to Facebook, if you're like me and no longer use Facebook, Cardhop offers a valuable utility to help you better remember your loved ones' special days. Group management. 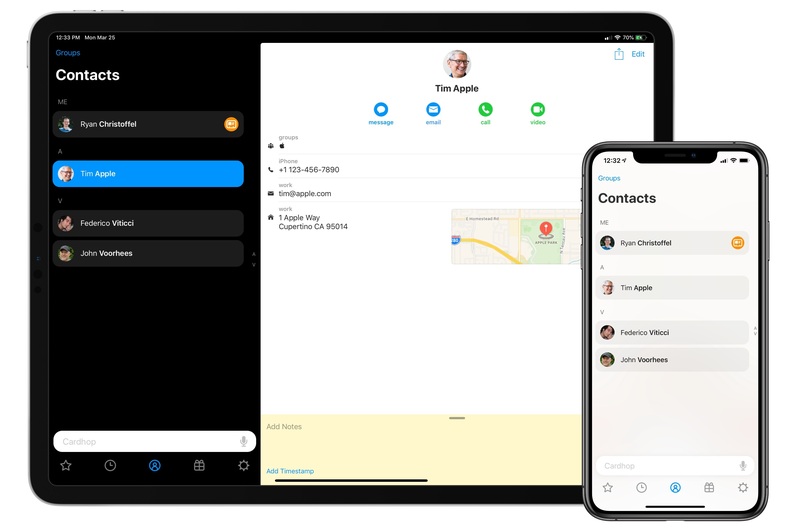 For some inexplicable reason, Apple has decided that the ability to create and manage contact groups is the type of pro task that only a Mac should be able to handle. Fortunately, Flexibits takes a different approach. In Cardhop you can create new contact groups, modify existing ones, and add or remove users from groups. You can also filter your main contacts view to only display certain groups, or even exclude some. Business card. You can set up a custom business card for yourself in Cardhop, which will load on iPhone whenever you turn your phone into landscape orientation. This business card can exclude any data points you want from your personal contact, such as your address for example. The business card presents a QR code that can be scanned by the person you just met, or there's also an option to manually share via the share sheet. Directory lookup. Cardhop integrates with your existing contacts database on iOS, but the app also supports tapping into external directories of contacts stored on services like G Suite or Exchange. From Cardhop's Settings ⇾ Directories you can add a directory to easily locate both personal and work contacts. And much more. Browsing the Settings screen in Cardhop exposes a lot of other options that make the app ideal for power users who like additional control over their apps. You can set up Siri shortcuts for a host of different app functions, customize the keyboard actions and quick actions I mentioned earlier to your liking, set up notifications for upcoming birthdays, tweak the app's color theme, activate automatic clipboard detection for data input, and also set the app to instantly trigger the search field when you launch Cardhop. The only negative takeaway I've had from my time with Cardhop is that the app's method of displaying contact photos varies slightly from Apple's app, such that while the same images from Contacts are visible inside Cardhop, they're cropped in such a way that, in some cases, you can't see the important details of a person. Many of my contact photos look fine in Cardhop, but a few unfortunately have the tops of their heads cropped out. Hopefully Flexibits can address this in future update. Like many of Apple's built-in apps, Contacts on iOS isn't a bad app, but it does lack a lot in the area of power user features and appears largely development-stagnant. It's fine for the average user, but its limitations open ample opportunities for third parties like Flexibits to capitalize on. And capitalize they have. Cardhop is a Contacts replacement that successfully addresses the limitations of Apple's app, anchored by a powerful natural language input system and a host of clever features that are absent from Contacts. It's the quintessential example of a great third-party alternative: while Apple's default app is fine for many, Cardhop brings the additional power and flexibility that other users crave. Cardhop is available on the App Store as a universal app for iPhone and iPad (where it supports Split View and all iPad Pro sizes). Its normal price is $4.99, but for a limited time it's available for $3.99.